It is lovely now that Bob is old enough to watch things that we enjoy too. At the weekend, she loves staying up later than Bow and watching a film with us. It is lovely to have some family television time that doesn’t involve Peppa Pig. On Friday night we watched the new film in the Diary of a Wimpy Kid series. We haven’t seen the other films but I have heard that there is a new cast in this film. Unfortunately actors continue to age when characters are timeless. This didn’t bother us as this is the first Wimpy Kid film that we have watched. Diary of a Wimpy Kid – The Long Haul sees the family take a road trip to attend grandma’s birthday. The boys want to make a detour to a video game conference but their Mum has banned all technology in attempt to have some quality family time. The boys decide take matters into their own hands. Bob loved this film and she was giggling constantly. I enjoyed it too and Bob’s daddy put his phone down for once as he wanted to watch the film. The addition of a piglet (a prize from a country fair) made the film even more enjoyable. To celebrate the release of this film I have 3 copies of the DVD to giveaway. There are many ways to enter using the Rafflecopter below. Good luck! 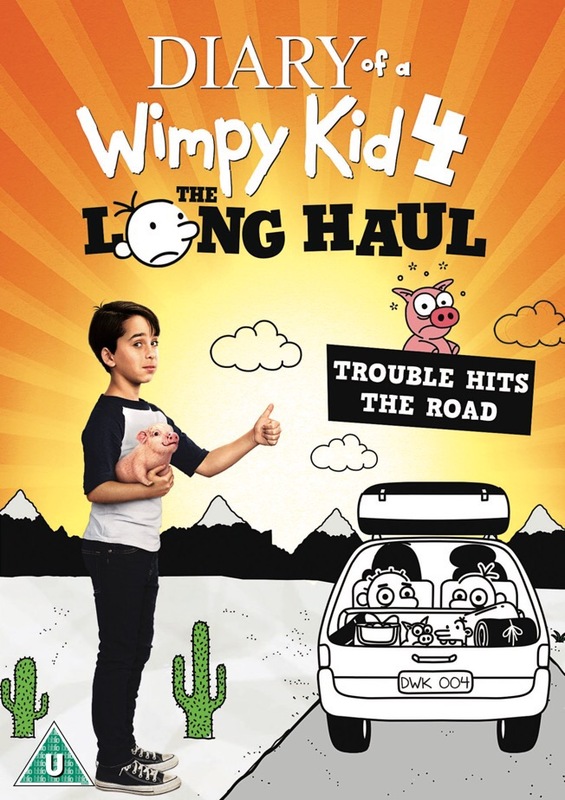 Diary of a Wimpy Kid: The Long Haul is available on Digital Download on 9th October and Blu-ray™ & DVD on 23rd October, from Twentieth Century Fox Home Entertainment. The Jungle Book -that movie always gets us all singing along! Liar Liar. It’s so funny. We love Up, it’s such a sweet emotional movie. I’ve always liked ‘The Goonies’ …because of the adventure involved and coming together as a team. Nanny McPhee. I love the happy ending. we love National Lampoons Vacation. Toy Story is a favourite. Elf, it’s had it’s first outing of the season this afternoon !. Will be watched many times before New Year. I love Beauty and the Beast. Love watching it with my two kids. the kids are loving hook at the moment. We are movie mad. I love sing. My daughter loves Nativity and my son loves The Lego Movie. Cant wait to watch Diary Of A Wimpy Kid. This time of year it has to be the Polar Express, the girls are getting all excited about their visit from Santa. Muppets Christmas Carol. It’ll be on sometime over the holidays and our family will be watching it! The Muppets Christmas Carol is our favourite. We love to watch The Secret Life Of Pets! We love the Toy Story films, especially the 3rd one.